Join Superstar Ansuya for 2 action packed workshops at Hipnotic Dance Studio. This 2nd generation fusion master brings a lifetime of experience to Miami. Don't miss this rare opportunity to study with one of the worlds leading bellydance stars. 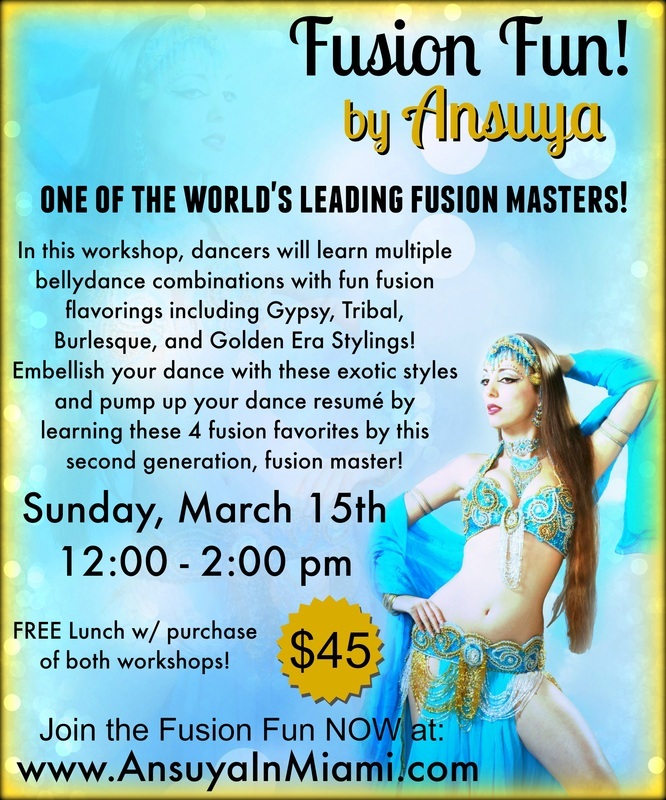 Dancers will learn multiple bellydance combos with fun fusion flavorings including Gypsy, Tribal, Burlesque, and Golden Era Stylings! Rev up your bellydance with these favorite fusion styles! Students will learn combinations in each of these fun styles to perform separately or as an added flair to their bellydance! LUNCH 2:00 - 3:00 p.m.
Register for BOTH workshops and get FREE LUNCH! This original Superstar of Bellydance will empower you with the tools, techniques and secrets used by the Superstars themselves. Ansuya will help you take your dance to the superstar level. Dancers will shine brighter after leaving this workshop… guaranteed! Bring your Superstar related questions! Ansuya will be answering all your juicy questions about behind the scenes gossip, to business, to touring, to entrepreneurship, to spirituality, to health, to secrets of having star charisma… now is your chance to ask Ansuya anything! Don’t be shy! She won’t be! Be ready to find your inner Bellydance star, have fun, laugh, and play all day! Ansuya In Miami! Choose an option.